Editors are not here to coddle you and the process of editing is not designed to stroke your ego. We are here to pound, smelt, and craft your rough diamond of a story into a multi-faceted jewel. And we’ll do whatever we must to achieve that goal. Granted, you have to have a gem to begin with; we can’t make cow poop into quartz, let alone a diamond. 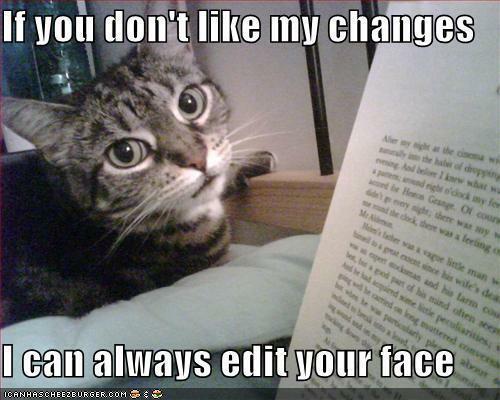 But if your story is good, with a few rough edges, editors help to smooth that out. And the process of smoothing often involves cutting excess material. Yes, the dreaded word “cut.” The fact is that a lot of what writers write isn’t that good. There’s a kernel of wonder, but it’s lost under weight of too much round-about prose. And since we are the author of said prose, we can be a little blind to its failings and want to keep it. Like over-indulgent parents, we pamper and spoil our prose, which is good for neither children nor stories. Editors are the ones who take the prose (and parents) to task and point out all the flaws you’ve been ignoring or were simply not aware of. When you spend months or years working on a story, it’s easy to get lost and not realize that your story has become completely inscrutable to an outsider. Editors remind you of this and help you correct it, thus making your story better. There are different levels of editing that can be applied to one’s work. Some are very light and non-invasive and relatively cheap. Others are very detailed and in-depth, and consequently more expensive. REVIEW – the editor gives a short (1-2) overview of the work, highlighting major trouble areas or things that leap out at the reader. This is the least invasive, but also the least helpful. PROOFREADING – minor errors in grammar, punctuation, word usage, and spelling are addressed. SUBSTANTIVE / DEVELOPMENTAL EDITING – the most intensive form of editing that addresses problems with the work as a whole, rewriting and moving things around, making any cuts or changes that are needed. I don't know…I sort of like filling the hearts of artists with fear as I approach with my red pen in hand…^_^But yes, editors do a lot more than people give us credit for.